Wild water buffaloes are larger in all proportions, better coordinated, quicker moving, and considerably more aggressive than their domestic cousins. Historically, they were distributed throughout much of mainland Southeast Asia and relatively commonly recorded in open forests of eastern Cambodia during the 1950s. However, the species has undergone a massive decline in the region and is now confined to a few scattered populations. One of the few remaining populations is in Mondulkiri province, in the Cambodian portion of the Lower Mekong Dry Forest Ecoregion, where their presence has been confirmed by tracks and WWF camera traps. 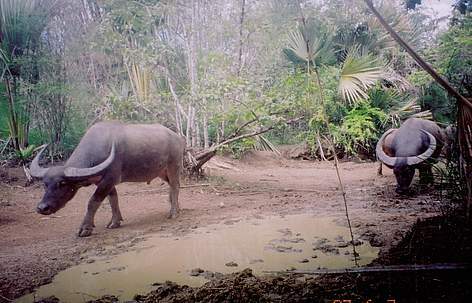 The Wild water buffalo population was a major factor in the decision to place further protection on the area, now designated as Mondulkiri Protected Forest. The Cambodian population is under severe threat from trophy hunting for its crescent-shaped, ribbed horns spanning over two meters and inbreeding with domestic buffalo.